Media reports (3 AW, SBS, Ch 9) on Monday 11th February 2019 confirms that a vitamin C tablet twice a day could help more than one million Australians with type 2 diabetes reduce their blood sugar levels this recent Victorian study has claimed. “The Deakin University study, published in the Diabetes, Obesity and Metabolism journal, found taking two 500mg doses daily can lower elevated blood sugar levels and reduce post-meal blood sugar spikes in type 2 diabetics. 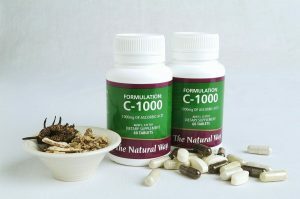 Prevent blood sugar spike and improve your immune system by taking The Natural Way’s Formulation C-1000, one tablet per day for health, and 2 tablets a day for weight loss (stimulates the thyroid). Vitamin C (also known as ascorbic acid) is a vitamin which is extremely important for the health of the whole body. Ascorbic Acid acts as antioxidant and provides Vitamin C. Formulation C-1000 contains Vitamin C in its most natural form -The Natural Way source their vitamin C from rosehip and capsicum. Vitamin C is a water soluble vitamin – this means it cannot be stored in the body, so must be ‘replaced’ daily.